A220 Alkaline batteries. Battery equivalent to M504 MN154 BLR154 220 BA332/U W10E V74PX KA74 W10 10F15. Price: £9.50 each. £9.10 each if you buy two or more. Postage and packing included. Also known as: Eveready 504, Duracell M504, Mallory M504, MN154, B154, BLR154, Exide DH554, Rayovac 220, BA332/U, Panasonic W10E, Burgess Y10, GP 220A, Varta V149U, Varta 74, Pertrix 74, V74PX, Kodak KA74, W10, TR149, NEDA 220, ANSI 220, IEC 10F15. 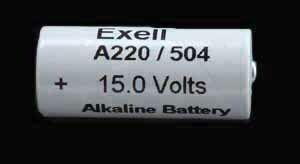 This A220 (Eveready 504, Rayovac 220 or BLR154) battery is alkaline and cylindrical. It is the perfect replacement for the hard to find Eveready 504. The original Eveready 504 is Carbon Zinc and a rounded off square in cross section (Height 34.9mm, Length15.1mm, Width15.9mm). This alkaline A220 (Eveready 504, Rayovac 220 or BLR154) battery is a fine replacement. This 220 (Eveready 504, Rayovac 220 or BLR154) battery fits the Minox flashgun for AG-1 and Rollei 16S flashes. This 220 (Eveready 504, Rayovac 220 or BLR154) battery also fits several Polaroid flash guns such as the 202. This A220 (Eveready 504, Rayovac 220 or BLR154) battery fits the Fox Micron P Alarm. This A220 (Eveready 504, Rayovac 220 or BLR154) battery fits the Model 71 AVO Meter, the Model 73 AVO Meter and others. This A220 (Eveready 504, Rayovac 220 or BLR154) battery fits the Morini CM84E (and CM84EL) free pistol. The Morini CM84E and CM84EL pistol has a light emitting diode in the trigger guard assembly which will only allow the pistol to fire if the light beam is blocked by the presence of a finger on the trigger. The down-side is that battery consumption is increased by having to have the light emitting diode turned on all the time, so ensure you shut the switch off or you will drain your A220 battery. This Eveready 504 (Eveready 504, Rayovac 220 or BLR154) equivalent battery also suits old versions of the Morini 162E and 162EI and also fits the Feinwerkbau Model 90 ( FWB 90) air pistol. This A220 (Eveready 504, Rayovac 220 or BLR154) battery fits the Gossen Sixtron exposure meter. This A220 (Eveready 504, Rayovac 220 or BLR154) battery fits the Nikon BC-7 flash unit. This A220 (Eveready 504, Rayovac 220 or BLR154) battery fits both Bang & Olufsen's Beosystem 6000, Beosystem 6002 and Beosystem 2400 ultrasonic remote control Commanders. These 220 (Eveready 504, Rayovac 220 or BLR154) batteries have a shelf life in excess of four years. Why not buy two or more packs, take advantage of our reduced price and make sure you are not left unable to use your camera or pistol next time your battery runs out.